This is a very special thank you to the AHS Patriettes, Ms. Rayburn and Ms. Marches and all those special dancing young ladies that Mr. and Mrs. Duez has had in class throughout the years. The spirit of your team is so strong and all of you represent AHS with such incredible grace, talent, and class. Thank you for donating money to our MS Foundation Campaign this spring. The Patriette Spring Show was inspiring. Thank you as well for inviting Mrs. Duez and I to the Patriette banquet. We were grateful for you to allow us to share in that special night with all of you. As the National MS Society slogan says: "Keep Moving!" I have been honored to dance at half time during the father-daughter dance as a fill in for two of my very favorite former students. So I guess I have always jokingly considered myself as an 'honorary' Patriette. :) After all of your kindness and love this spring, I really feel like one! 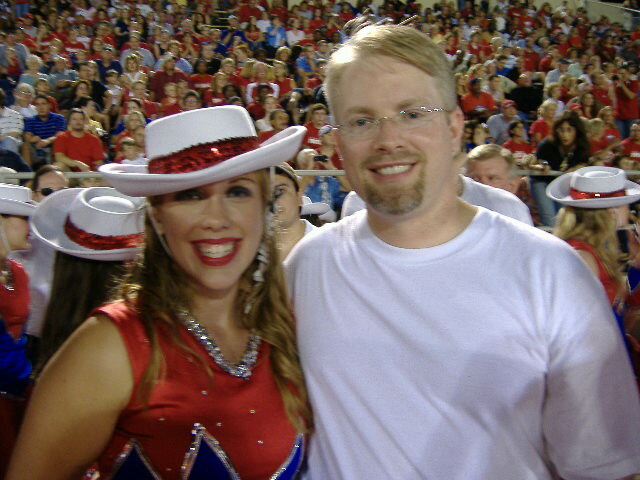 After dancing at half time with Rachel Winfrey in 2006. Coming off the field in 2008 with Valonia Walker. Wow, I was an awful dancer! She made me look good. Thank You very very much for writing and commenting. That means a lot to me that you have good memories. Hope you are doing well.